Of all the teachers you’ve had in your life, which one do you remember most fondly? If you’re lucky, you’ve got someone in mind—a teacher who encouraged and inspired you and perhaps played a role in shaping the person you are today. That same teacher could well be thinking similar thoughts about you!—because for every favorite teacher, there is also a favorite student. The satisfactions often go both ways. In this section, we look at ways in which you can cultivate rich and rewarding relationships with your instructors, and also resolve conflicts, should any arise. 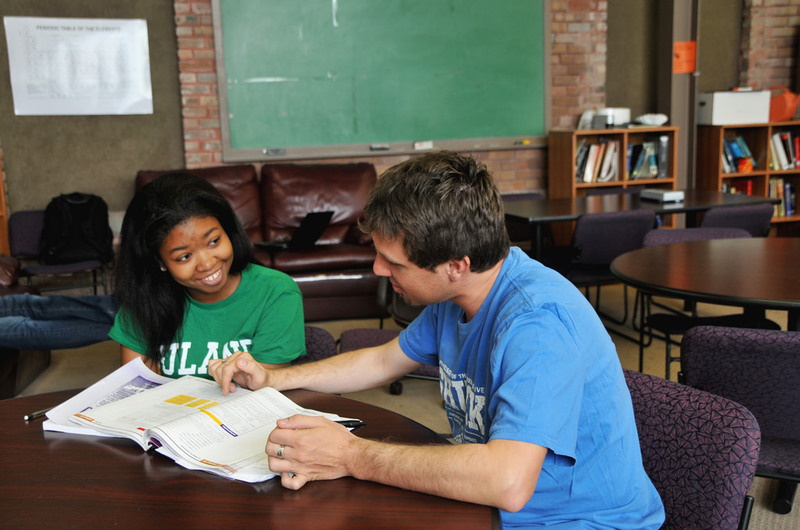 Solid student-faculty relationships can be foundational to a successful college experience. The following video, from Dickinson College in Carlisle, Pennsylvania, looks at the value teachers and students place on connecting with one another. College students are sometimes surprised to discover that instructors enjoy getting to know students. The human dimension of college really matters, and as a student you are an important part of your instructor’s world. Most instructors are happy to work with you during their office hours, or talk a few minutes after class, respond to digital messages, talk on the phone, or engage in online discussion forums or perhaps course wikis or personal journals. These are some of the many methods of communication you and your instructors can use. The following video, from the University of British Columbia, shares faculty perspectives on some of the many reasons why students might want to talk to their faculty or to teaching assistants (TAs). One of the many benefits of communicating with instructors is that it can help you feel more comfortable in college and more connected to the college culture. Students who communicate with their instructors are less likely to become dispirited and drop out. Communicating with instructors is also a valuable way to learn about an academic field or a career. Maybe you don’t know for sure what you want to major in, or what people with a degree in your chosen major actually do after college. Most instructors will share information and insights with you. You may also need a reference or a letter of recommendation for a job or internship application. Getting to know some of your instructors puts you in an ideal position to ask for a letter of recommendation or a reference later on. Think about what being “educated” truly means: how one thinks, understands society and the world, and responds to problems and new situations. Much of this learning occurs outside of the formal class. Communicating with your instructors can be among your most meaningful experiences in college. Prepare before meeting with the instructor. Go over your notes on readings and lectures and write down your specific questions. You’ll feel more comfortable, and the instructor will appreciate your being organized. Respect the instructor’s time. In addition to teaching, college instructors participate in committees, conduct research and other professional work, and have personal lives. It’s not appropriate to arrive several minutes before the end of an office hour and expect the instructor to stay late to talk with you. Understand that the instructor will recognize you from class. If you spent a lecture hour not paying attention, it will reflect badly on you to come to an office hour to find out what you missed. Don’t try to fool an instructor. Insincere praise or making excuses for not doing an assignment will rarely play in your favor (they’ve heard it all before!). Nor is it a good idea to act like you’re “too cool” to take your classwork seriously—another attitude that’s sure to put off an instructor. To earn your instructor’s respect, come to class prepared, do the work, genuinely participate in class, and show respect—and the instructor will be happy to see you when you come to office hours or need some extra help. Try to see things from the instructor’s point of view. Imagine that you spent hours preparing for class, on a topic that you find very interesting and exciting. You are gratified when people understand what you’re saying—they really get it! And then a student after class asks, “Is this going to be on the test?” How would you feel? Be professional when talking to an instructor. You can be cordial and friendly, but it’s ideal to keep it professional and on an adult level. Come to office hours prepared with your questions—not just to chat or joke around. (Don’t wear sunglasses or earphones in the office or check your cell phone for messages.) Be prepared to accept constructive criticism in a professional way, without taking it personally or complaining. The following infographic gives you a visual way to remember key concepts about communicating with your instructors. Just as digital messaging has become a primary form of communication in business and society, it has a growing role in education and has become an important and valuable means of communicating with instructors. Most college students are familiar with digital messaging, such as email, texting, and messages via the online-course learning-management system. Using digital messaging respects other people’s time, allowing them to answer at a time of their choosing. However, digital communication with instructors is a written form of communication that differs from communicating with friends. Students who text with friends often adopt shortcuts, such as not spelling out full words, ignoring capitalization and punctuation, and not focusing on grammar or using full sentences. Such texts are usually very informal and are not an appropriate style for communicating with instructors. Your instructors expect you to use a professional, respectful tone and fairly formal style. Use a professional email name. If you have a nickname you use with friends, create a different account with a professional name for use with instructors, work supervisors, and others. “BoatyMcBoatface” is not an appropriate, professional email name. Include something in the subject line that readily communicates the purpose/topic of your email: “May I make an appointment?” says something; “Help!” doesn’t. Address digital messages as you do a letter, beginning “Dear Professor ____.” Include your full name in the closing. Get to your point quickly and concisely. Write as you would in a paper for class, avoiding sarcasm, criticism, or negative language. Avoid abbreviations, nonstandard spelling, slang, and emoticons like smiley faces. When you reply to a message, leave the original message within yours. End the message with a “Thank you” or something similar. Proofread your message before sending it. Wait to send if you are upset. With any important message, it’s a good idea to wait and review the message later before sending it. You may have expressed an emotion or thought that you will think better about later. Many problems have resulted when people send messages too quickly without thinking. The most common “conflict” that students experience with instructors is feeling that they’ve received a lower grade than they deserve. This may be especially true for new students not yet used to the higher standards of college. It can be disappointing to get a low grade, but try not to be too hard on yourself or on the instructor. Take a good look at what happened on the test or paper and make sure you know what to do better next time. If you genuinely believe you should have a higher grade, you can talk with your instructor. How you communicate in that conversation, however, is very important. Instructors are used to hearing students complain about grades, and they will likely patiently explain their standards for grading. In general, instructors seldom change grades. Still, it can still be worthwhile to talk with the instructor. You will gain from the experience even if your grade doesn’t change. Go over the requirements for the paper or test and the instructor’s comments. Be sure you actually have a reason to evaluate the grade—not just that you didn’t do well. Be prepared with specific points you want to discuss. Make an appointment with your instructor. For face-to-face classes, don’t try to talk about your concern before or after class. Be polite. Begin by politely explaining that you thought you did better on the assignment or test (not simply that you think you deserve a better grade) and that you’d like to go over it to better understand the result. Use good listening skills. Whatever you do, don’t argue! Ask what you can do to improve the grade, if possible. Can you rewrite the paper or do any extra-credit work to help make up for a test score? While you are showing that you would like to earn a higher grade in the course, also make it clear that you’re willing to put in the effort and that you want to learn more, not just get the higher grade. If there is no opportunity to improve on this specific project, ask the instructor for advice on what you might do on the next assignment or when preparing for the next test. You may be offered some individual help or receive good study advice, and your instructor will respect your willingness to make the effort—as long as it’s clear that you’re more interested in learning than getting a good grade. Visit early: Building rapport with your professors early in the semester will pay off if you need an extension or extra help later on. Professors like it when you visit office hours, but they don’t appreciate it when panicked students ask for an extension an hour before an assignment is due. Most professors will be very accommodating if you ask for help well in advance. Show your interest: Professors want you to be as interested in their subject as they are. Nothing excites them more than knowing you are passionate about what they teach. You can show your interest by participating in class, attending office hours, and emailing your professors if you have questions. Meet your professor: Professors have many responsibilities to juggle including research, teaching, traveling to conferences, and administrative tasks. However, they DO want to talk with you. 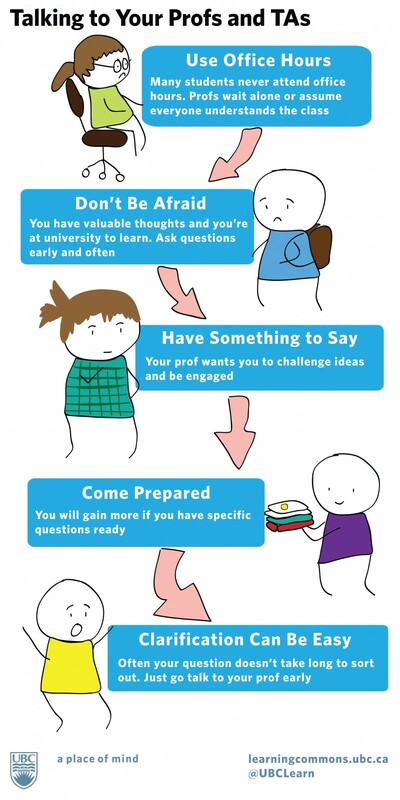 Go to office hours and meet your professors! Build relationships: Believe it or not, your professors are really interesting people. You might just enjoy their company. They can also open doors to academic research, serve as mentors, and may write you a reference letter down the road. Build strong relationships with your profs while you have the chance. The word instructor comes from the Latin word struere, meaning build, construct. Make a list of ten ways in which you could take advantage of communicating with your instructor to help build and construct a powerful learning experience.